A few Govt. 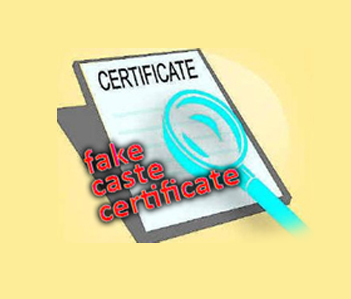 Employees, Public Servants and others availing benefits like Jobs and other opportunities by managing to get fake caste certificates. In this regard, the Govt. Of Odisha SC & ST Development Department have issued model guidelines vide letter No.22076/SSD dt.12.06.09 and resolution No.53 dt.01.01.2010. The Directorate of ST & SC Development Dept. Shall constitute a ‘Vigilance Cell’ consisting of Senior Superintendent of Police in over all charge with such number of Police Inspectors as required to investigate into the social status claims of scheduled caste and Scheduled Tribe candidates. Senior Deputy Superintendent of Police of each district will be in charge of the Vigilance Cell of the district which will be under the Directorate of ST & SC Development Department and with the help of the Police Officers not below the rank of Inspectors of Police in Charge of the local area will investigate into the social status of the ST & SC candidates in relation to their castes as referred to by the Director, ST & SC Development for verification. The concerned investigating officer i.e. the Inspector of Police of the concerned area, where the candidates whose social status is to be verified originally hails or usually resides, would go to the local place of residence and the original place from where the candidate hails and usually resides or in case of migration to the town or city or the place from which he originally hailed from and will collect the information regarding the genealogy, ethnological traits, deity, rituals, customs mode of marriage, death ceremonies, method of burial of dead bodies etc. By the concerned castes or tribes or tribal communities for determining the caste/community status of the alleged person/candidate and his/her family members. The Inspector of Police should personally verify and collect all the facts of the social status claimed by the candidate of the parent of guardian as the case may be. He should examine the school records, birth registration, revenue records, voter list etc. If any, as available. The Inspector of Police should also examine the parent, guardian or the candidate in relation to their caste etc. Or such other person who have knowledge of the social status of the candidate and record their statements with their signature/thumb impression as the case may be. In case the candidate or persons whose statements so recorded refuse to sign, in that case, signature of two witnesses to the recorded statements be taken one of which may be a Govt. Servant preferably to the effect at that the person decline to sign the statement given. In particular, about the Scheduled Tribes the Inspector of Police should enquire relating their peculiar anthropological traits, deity, rituals, customs, mode of marriages, death ceremonies, method of burial of dead bodies etc. By the concerned castes or tribes or tribal communities. For conducting the enquiry, the Inspector of Police may take the assistance of local Tahsildar/Revenue Inspector and peruse revenue records as may be necessary. The original place of birth and migration of the alleged person, his/her parents & other family members, his close paternal, maternal and marital kins. The places and institutions where he/she or they work (s) or have worked. The places of past & present residence. Other agencies and institutions where relevant information about him/her or them may be available. II. Contact, Interact with, Elict required information, record signed Statements and solicit cooperation from. The local leaders, public representatives (including the panchayat functionaries like Block Chairman, Sarpanch, Ward Member, Panchayat Secretary, Etc. The local public functionaries like WEO and other extension officers of the Block, the VLW, the Ariganwadi Workers, ASHA Worker, School Teachers & Headmasters, Tahsildar & Revenue Inspector, Amin & Supervisor , Post Master & Post Peon, Etc. Local NGO Representatives & Social Activists. Knowledge and elderly persons of the locally. The accused, his/her parents & other family members, his close paternal, maternal and marital kins. His/her Genealogy (family tree) minimum up to 2 generations above him/her and 2 generations below him/her i.e. from his/her grandparents to his/her grandchildren and draw a Genealogical Chart indicating the Name, Age, Place of Residence and Work, Caste/Tribe Name of Him/her and all his kins shown in the chart. The distinguishing anthropological and ethnological traits, such as. Dress, ornaments & personal appearance. Deity, rituals, religious beliefs and practices. Birth, Marriages, and death customs & ceremonies including disposal of dead bodies, etc. Pattern of Livelihood, food and drinks. Traditional Community organizations and functionaries. Relationship with other communities of the concerned caste of tribal communities. - To which he/she claims to belong to. School / College Records & ID Cards. Voter Lists & Voter ID Cards. PAN Card, Credit/Debit Cards, Bank/Post Office, Health & Insurance Cards. Caste Certificates, Nativity/Residence, Income Certificate, Case Records. Service/Employment Records & ID Cards. Bank/Post Office savings & Loan Records. NGO Records (if the alleged or his close kins are members or beneficiaries). Records of cases/disputes relating to property, marriage, caste certificates, etc. Records of Community Organization, Social, Cultural, Religious and political organizations in which the alleged or his close kins are members or beneficiaries. V. Assess the Kind & Quantum of Benefits availed by the Alleged Person (Candidate) and his family members under the Fake Community Identity as SC & ST from various Govt. And Govt. Supported sources. Reservation of Seats & receipt of Stipends/ Scholarships and other benefits in educational institutions. Reservation in appointment & promotion in Public Service. Benefits under various Development & Welfare Schemes & Programmes. Health Care & Insurance Benefits. VI. In case the Alleged Person (Candidate) is dead and his caste/ community identity is found to be fake, the I.O taking the help of the genealogy should assess the kind & Quantum of Benefits availed by each of his/her family member. After completion of the process of Investigation, the records and information collected from different sources should be processed and analysed to reach a logical conclusion about the true Social Status of the alleged person. All these facts and findings should be reflected in the Enquiry Report on the basis of which the final conclusion should be drawn. Relevant records and documents in support of the facts and findings should be enclosed with the report.